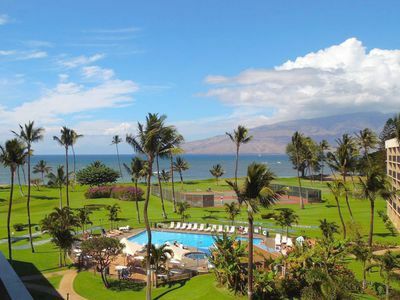 The Palms at Wailea - Romantic Getaway! 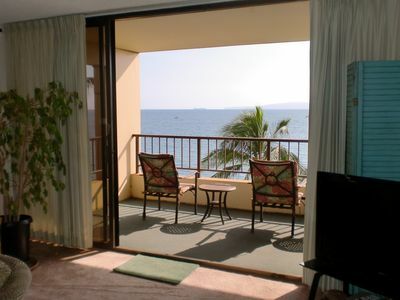 Our Wailea, Maui condo #1304 has lovely ocean views from the lanai that will captivate you as you have your morning coffee or tea; or catch the sunset in the evening after a day of sightseeing, golf or a relaxing day at the beach or pool. 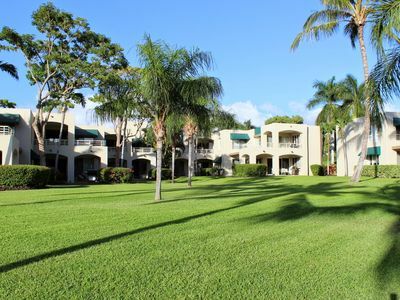 The condo is very spacious (1022 square feet inside, plus 2 covered fully tiled lanais with 374 square feet outside) and faces an expansive lush garden area lined with lovely palm trees stretching out to the ocean. 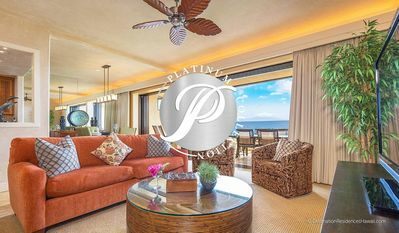 This is considered one of the most desirable one bedroom villas at the Palms because of it's beautiful ocean views, 2 lanais, and close proximity to the pool and clubhouse. 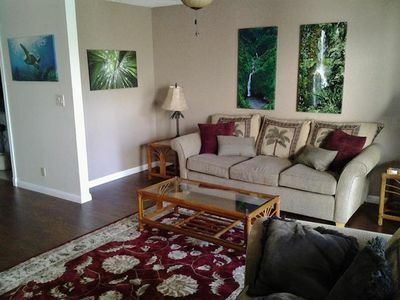 The villa was remodeled in August/September of 2008, and offers our guests a truly tropical haven. Furnishings are 'Tommy Bahama' style. A new king size Saatva luxury mattress was added in 2017. 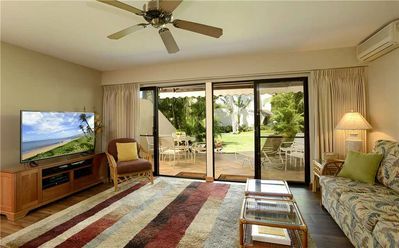 New larger capacity washer/dryer was added in late 2014, as well as a new pass through slide window in kitchen that opens to the dining lanai, and larger recessed lighting in kitchen. In June 2015 all new Stainless Steel appliances were installed in the kitchen. 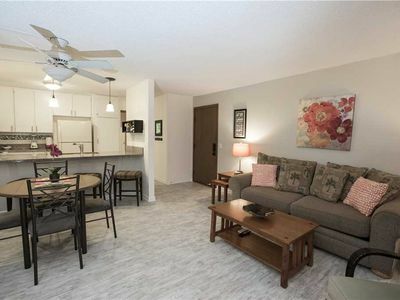 There is 20 inch porcelain tile throughout the villa, with ceiling fans in master bedroom and living room and dining area. There are also two separate air conditioners for those that want to stay even cooler in the master bedroom and living room. 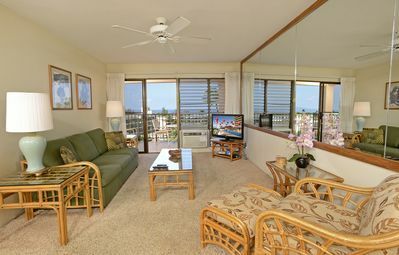 There is a 42' plasma television in living area, and a 36' television in the bedroom. DVD/VCR player and CD player and ipod dock with stereo in living area. Portable telephone with free calls to U.S. and Canada included. Wi Fi is included in the villa, as well as at the pool area. Also added is our special guest cabinet stocked with spices, foil wrap, plastic wrap, napkins, tea, coffee filters, condiments (small packets) and a cooler for the beach. There are also boogie boards and beach chairs for use at the beach. Beach towels are provided at the front desk, and can be used at the pool or beach. 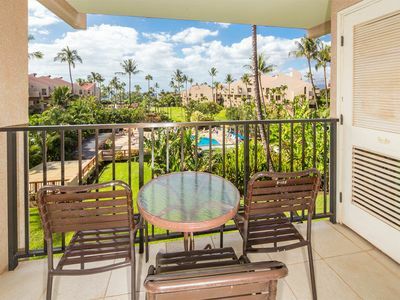 We have two outdoor lanai's. 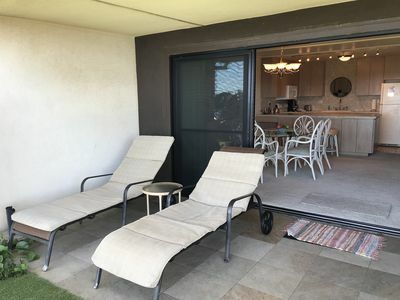 A lounging lanai with two new lounge chairs and a table, and a dining lanai with a table for four that has counter height chairs to take in the breathtaking views of the ocean. 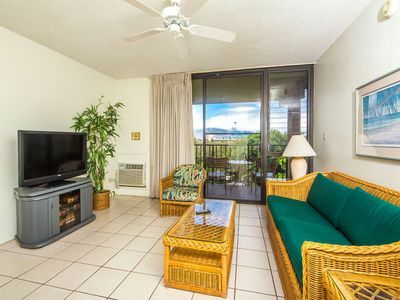 There is also a gas BBQ grill on the lanai if you want to cook your meals at home. The whale shaped pool with jacuzzi is surrounded by palms, and has stunning views of the ocean. 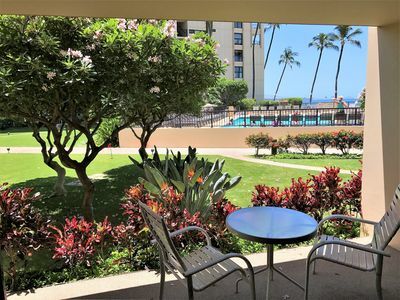 Just a two minutes drive away are the Shops at Wailea, featuring Gucci, Coach, Longhi's Restaurant, Tommy Bahama's store and restaurant, and Ruth's Chris Steak House. Also, only two minutes away by car (5-6 min. 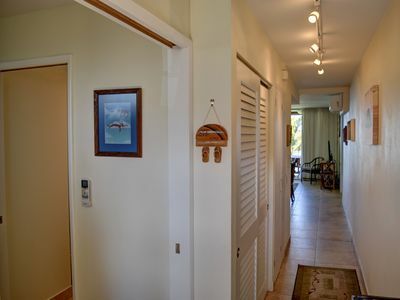 walk), is Keawakapu Beach with one-half mile of soft white sand, two entrances and three free parking lots. This is a great swimming and snorkeling family beach complete with bars and restaurants at the end of the beach. 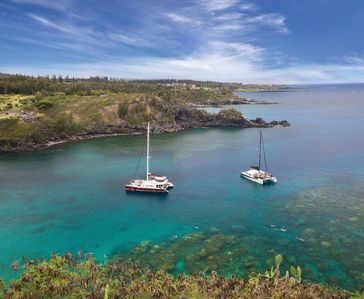 We love the snorkeling at Ulua/Mokapu Beach - very close to our villa in Wailea. The entrance is right next to the parking lot at the new Andaz Hotel. (It is where the old Renaissance Hotel used to be.) If you go to the Andaz, try their grilled lobster sandwich on sourdough bread - it is amazing. It's served at the Bumbye Beach bar/restaurant outside by the pool. In the evening by the upper pool they have live music, and it is a very romantic setting with the infinity pools stretching out to the ocean from the bar patio. 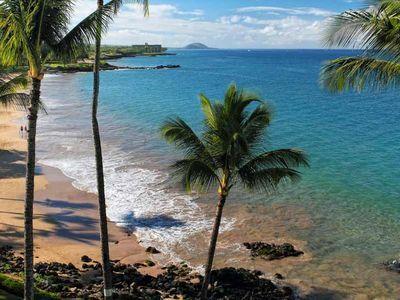 Wailea is a planned community, and is Maui's treasure on the south end of the island. 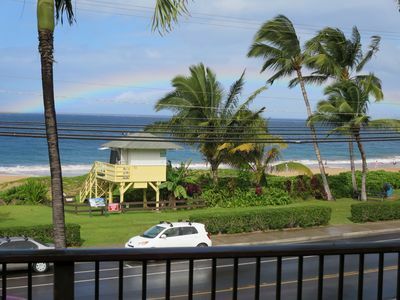 It has the best climate in Maui with annual rainfall of 10 inches, compared to Kaanapali's 29 inches. The average high temperatures range from 80 degrees to 89 degrees. Golfing in the Wailea area is spectacular. Wailea boasts 3 golf courses, one of which has hosted the Wendy's Senior Skins game. 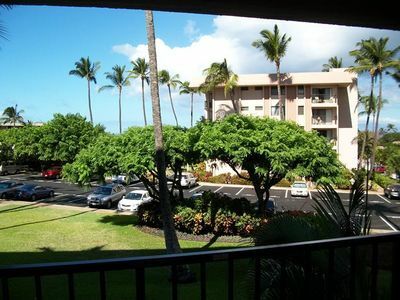 Or, try the Maui Nui Golf Course in Kihei - very reasonable rates! 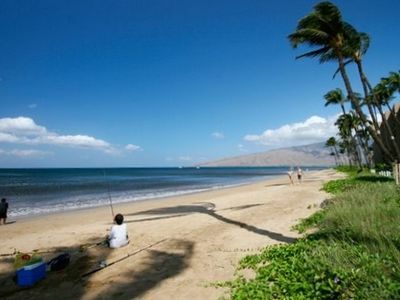 Nearby, Makena is the home of Big Beach. It is famous for its body surfing and boogie boarding. Pack a picnic lunch, a beach umbrella and make an afternoon of it at Big Beach! Check with the activity desk in the lobby, and book any of the many activities offered on the island. The activity desk offers golf discounts in Wailea. We provide you with a list of very good restaurants as options to go to when you book - as well as some of our guest's favorites. 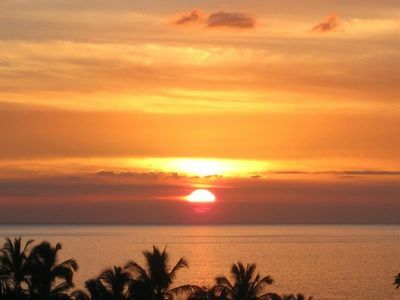 There is lots to do in Wailea, so you don't have too go far for great food and world renown spas. 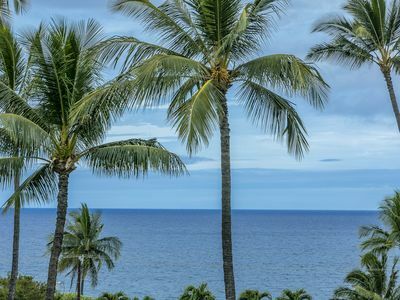 Treat yourself to an afternoon at the spa at the Grand Wailea, dinner at Nick's Fishmarket restaurant at the Fairmont Hotel, Wolfgang Puck Spago's restaurant at the Four Seasons or for fun and live music - go to the Monkeypod - it's a Merriman's restaurant. These are a few of our favorite places.